We are the pioneer leaders in Inserting pamphlet all across Mumbai. We have a set of dedicated people who are attached to this work for more than 5 years. We have been inserting pamphlet in the newspaper for various big Brands. 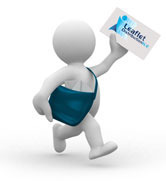 We are one of the top most pamphlet inserters around Mumbai, we are servicing many companies in Mumbai.